Vonya Young, an Iolani graduate, fell in love with Hartwick College after seeing their Web site on the Internet. Vonya Young and Elizabeth Alonzo wanted to play NCAA Division I water polo in college. They used different methods to decide on attending Hartwick College in Oneonta, N.Y., in the northern foothills of the Catskill Mountains. Young went to the Internet to search for colleges and finally narrowed her quest down to smaller colleges. What she saw on the Hartwick Web site was appealing. "Through their Web site I fell in love with the school. The pictures were beautiful," said Young, a 2003 Iolani graduate, who also applied to Hawaii, Creighton, Nevada and San Diego State. "The only thing the pictures didn't show was snow." She also wanted a campus with a small student body, and Hartwick's 1,450 student population was the right fit. "I didn't know exactly where Hartwick was. I thought it was close to New York (City), not a 4-hour drive. 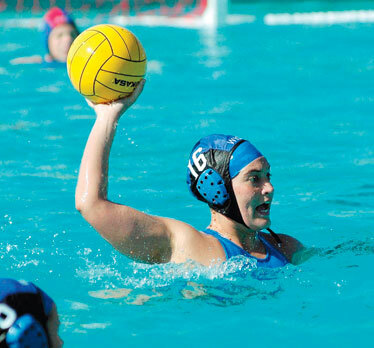 I just showed up my freshman year not even sure I was going to play water polo," said Young, who is majoring in nursing. Alonzo (Hilo '05) considered Hawaii, Hawaii-Hilo, Colorado State and Grove City (Pa.) and was undecided about whether to major in nursing or sociology. "I wanted to explore my options. When I visited Hartwick in March of my senior year and met the professors, I decided to go straight into the nursing program," Alonzo said. "When I got here, Vonya came up and gave me a big hug and kiss. Then I met the team and everyone was really nice and helpful. That was a big seller." Young's introduction to her new surroundings began on the drive from the Albany, N.Y., airport to Oneonta. "As we were driving I noticed there were less and less houses. And I realized there are hills everywhere. On campus, we are always walking up hills to class," said Young, who will not forget the 13 seniors on the Hawks team her freshman year. "I didn't know them, but they made me feel so welcome. That shaped my love for Hartwick College and helped me stick it out with water polo." Young is the secondary center for the Hawks, who have qualified for the NCAA final four two of the past three years and are one of two Division I teams at Hartwick (men's soccer is the other). She takes the focus off the primary center. "I encourage everyone with a good position to go into set (dead on in front of the goal) if they can get off a quick shot," said Young, who joined the program the same year Alan Huckins took over as head coach. Young and her roommate, Keri James from Wellington, New Zealand, are co-captains. They are the link between me and the rest of the team. Normally, I prefer one captain who leads outside the pool and one who leads inside the pool, but Vonya and Keri are an even match. It's unique, but it is working well," said Huckins. "Vonya's position is more like a center in basketball. Everything is focused around the center spot. On defense she guards the center position. "She has the quickest hands of anyone I have ever coached. She is right around the cage and reacts quickly to balls off the posts or goalkeeper." Alonzo played goalkeeper for three years at Waiakea for coach Dan Lyons before he left, then transferred to Hilo as a senior to play for her club coach, Ron Kohler. At Hartwick, Alonzo is backing up senior Olivia Colebourne, a member of the New Zealand national team. "If Elizabeth improves as much as from last year to next year she has a chance to be the starter. We have one or two goalkeepers coming in next year, but her experience will give her a jump-start," Huckins said. Alonzo says her positive attitude is one of her strengths. "I'm verbal and try to help everyone stay focused, to keep working hard. I help coordinate the defense. I want them to play the angles and stay between me and the ball," Alonzo said. "Even when someone is down, I try to compliment them to keep them going." She had seen and touched snow on the Big Island, but still wasn't ready for what is known as the Lake Erie Effect, snow squalls coming off the lake that sweep across upstate New York. "On the Big Island we would leave the mountain and go to the beach. Here, when the first snow hit, I went out and bought $200 worth of sweat pants," Alonzo said. Young graduates in May with a Bachelor of Science in nursing and will come home and look for a job. Alonzo plans to do the same two years from now. "I'm definitely coming back. I tried surfing in a wetsuit, but it's too hard," Alonzo said. The Hawks are in the largest water polo league (Collegiate Water Polo Association), and their chief rivals are Brown, Michigan and Princeton. They have made two trips to California this year to face the best competition on the West Coast. "I don't want to say we're accustomed to going to the NCAA tournament, but not only do we want to qualify, we want to win a championship," Huckins said. Hartwick has to win the Northern Championships this weekend and the Eastern Championships next weekend to earn the CWPA's automatic berth into the NCAA tournament.